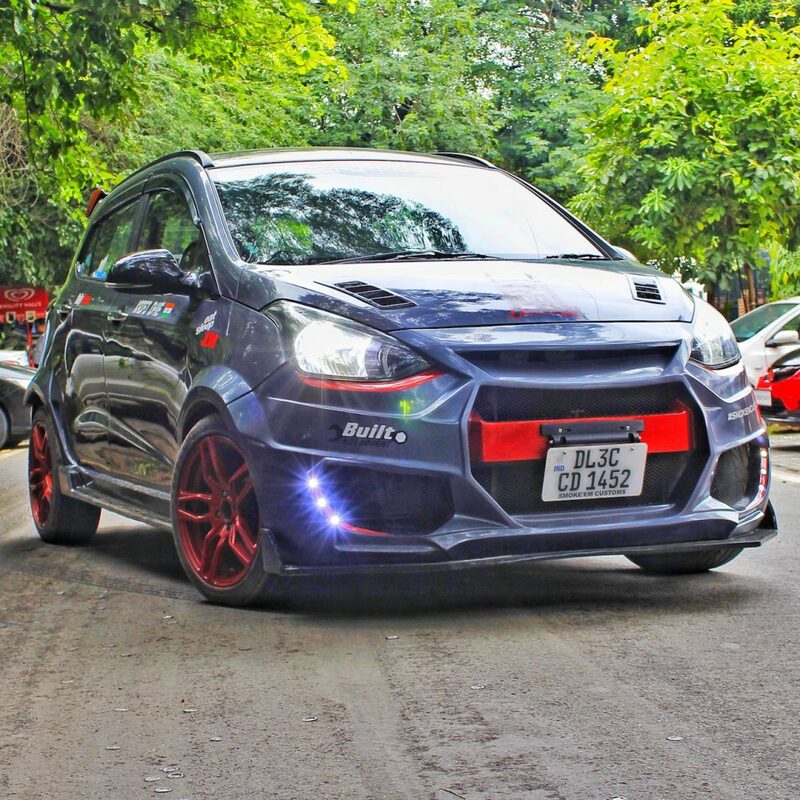 Hyundai Grand i10 Typhoon Edition is an example of how hatchbacks are born with an attitude towards rally racing and just need a little bit of work to keep things moving in the right direction. 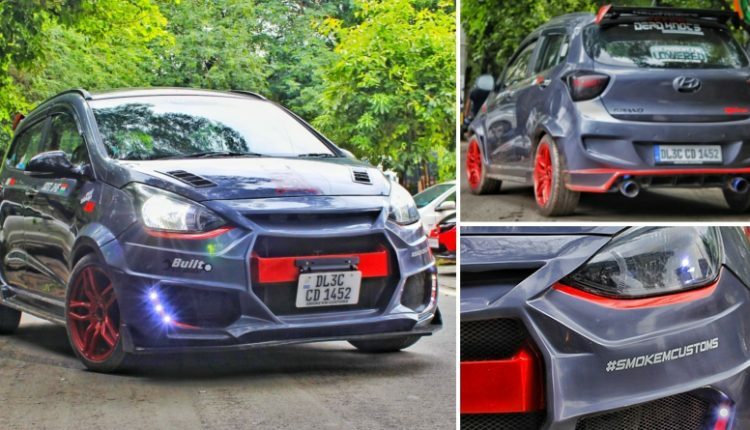 Smoke’em Customs from Delhi made this aggressive looking compact hatch, leaving the buyer with not just a good looking car but, 10 more horses under the right feet. 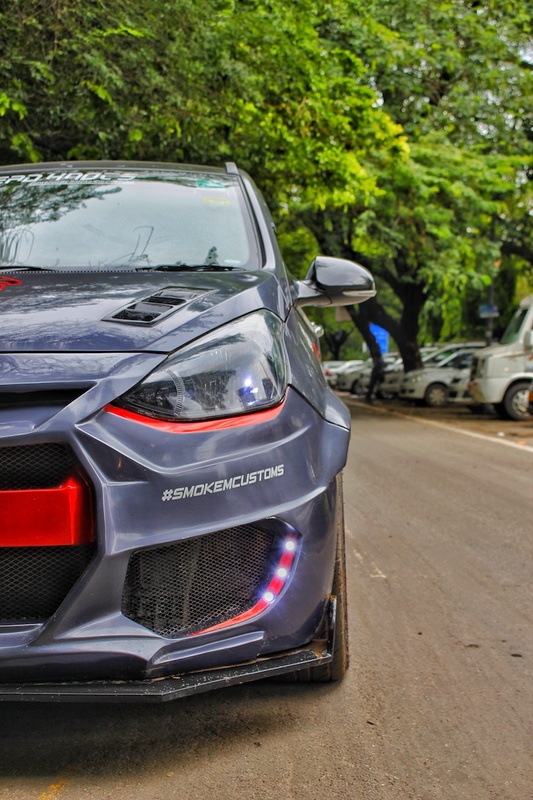 Yes, Typhoon has a total output of 92HP, thanks to the ECU tuning, BMC-sourced cold air intake and NGK iridium spark plugs. 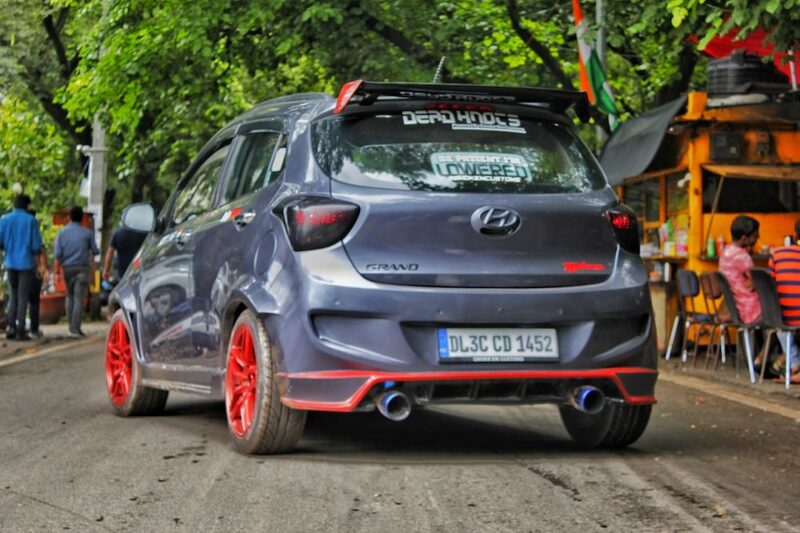 The overall suspension setup was lowered to get a sports car feel on this Grand i10. Using 16-inch wheels at all ends, Smoke’em Customs have got the side profile right in proportion with a heavily modified front end and accessorized rear section. The dual exhaust ends, redesigned bumper and large spoiler guarantees double head turn for pedestrians while front comes with a modified bonnet with dual vents and red inserts under the headlights. The front splitter, red alloy wheels, and smoked headlights are some worthy additions to the package. The overall pillar profile and roof finish were left untouched for a stable riding experience. The car comes with a leather steering wheel, Sparco gear knob, tan leather seats and a 7-inch touchscreen with a custom sound system. 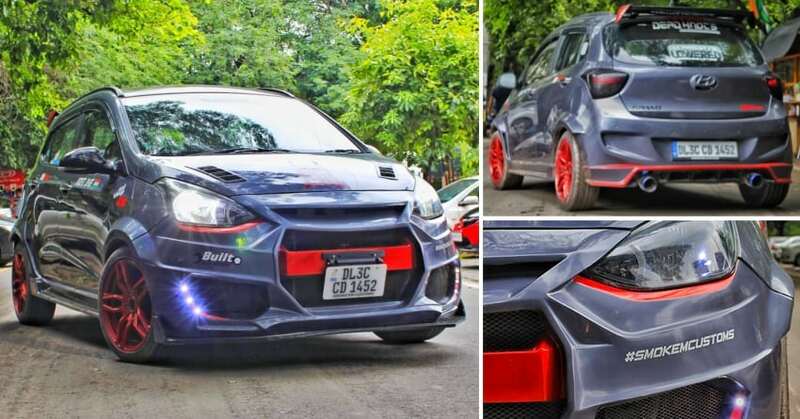 Apart from these modifications, the car comes with LED daytime running lights, interior mood lighting, custom decals over the exterior panels, rear parking camera and much more. 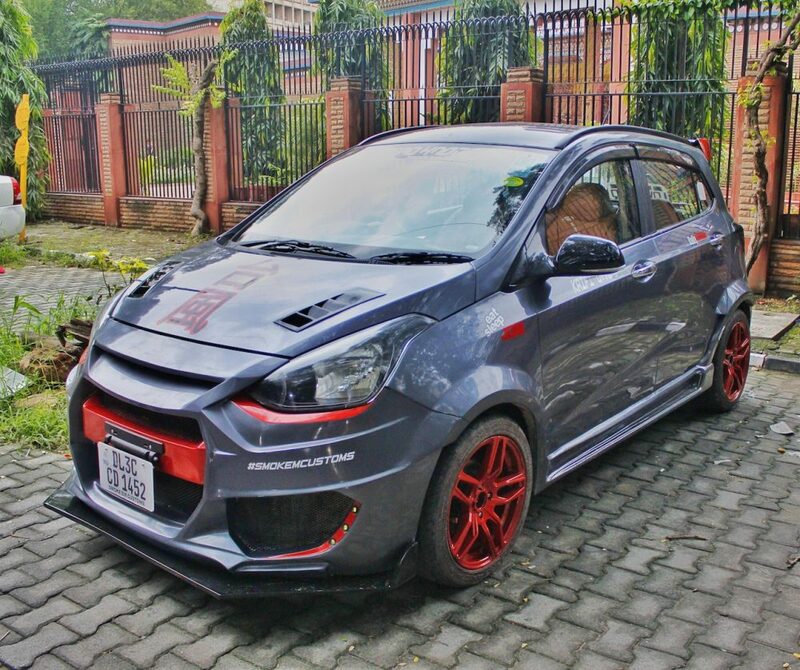 The total cost of customization, excluding the donor car, is INR 2.50 lakh. It takes 40-days for Smoke’em Customs to get your stock car ready with the Typhoon kit. Grand i10 from Hyundai comes with certain impressive features like push start with smart key and machine finished alloy wheels. A recent offer from Hyundai can let you get your hands on a top-spec Asta petrol variant for INR 5.99 lakh.